Working for a Storage Systems company, we are constantly looking at both the technical as well as social/marketplace challenges to our business strategy. Leading to the coining of “Cloud Meets Big Data” from EMC last year, EMC has been looking at the trends that “should” tip the balances around real “Cloud Information Management” as opposed to “data management” which is really what dominates todays practice. Completeness of Information for Purpose (e.g. making decision) = dependent on stuff I have, and stuff I get from others, but everything that I need to decide. I believe that 1) and 6) above point to an emerging need for Big Data Communities to arise supporting the requirements of the others. Whether we talk about these as communities of interest, or Big Data Clouds. There are some very interesting analogies that I see in the way we humans act; namely, the Shopping Mall. Common wisdom points to the mall as providing an improved shopping efficiency, but also in the case of inward malls, a controlled environment (think walled garden). I think that both efficiency in the form of “one stop”, and control are critical enablers in the information landscape. 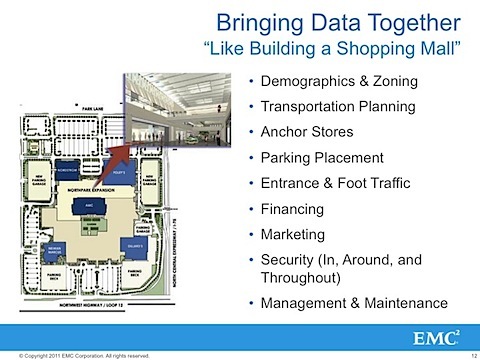 This slide from one of my presentations supports the similarities of building a shopping mall alongside the development of a big data community. Things like understanding the demographics of the community (information needs, key values), the planning of roads to get in/out. And of course how to create critical mass = the anchor store. Force = Mass * Acceleration (change in velocity). This means that in order to create communities and maximize force you need Mass [size/scope/scale of information] and improving Velocity [timelyness of information]. In terms of mass, truism #1 above, and the shear cost / bandwidth availability make moving 100TB of data hard, and petabytes impracticable. Similarly, velocity change does matter, whether algorithmically trading on the street (you have to be in Ft Lee, NJ or Canary Warf, London) or a physician treating a patient, the timeliness of access to emergent information is critical. So correct or not, gravitational forces do act to geo-locate information. In our case Height could be looked at as the bandwidth between N information participant sites, Mass as the amount of total information needed to process, and Gravity as a decentralization of information = the Outer Joins required for optimal processing. If I need to do a ton of outer joins across the Internet in order to get an answer, then I need to spend a lot of energy. So if malls were designed for optimal [human] energy efficiency, then big data malls could do exactly the same for data.